The writer, who was one of the literary world’s most powerful voices against apartheid – died at her home after a short illness, her family said. She won the Booker Prize in 1974 for The Conservationist and was awarded the Nobel Prize for literature in 1991. The Nobel committee said at the time it was honouring Gordimer for her “magnificent epic writing” which had been “of very great benefit to humanity”. 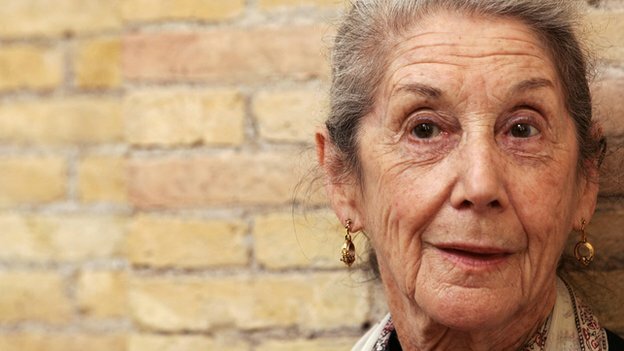 Gordimer’s family said she “cared most deeply about South Africa, its culture, its people, and its ongoing struggle to realise its new democracy”. Committed to fighting apartheid, the author was a leading member of the African National Congress and fought for the release of Nelson Mandela. They went on to become firm friends. A number of her books were banned by the South African government under the apartheid regime including 1966’s The Late Bourgeois World and 1979’s Burger’s Daughter. Posted on 14th July 2014 by newsafrica. This entry was posted in Africa, Anti-Apartheid, Arts, Mandela, Nadine Gordimer, Race Relations, South Africa and tagged African National Congress, Burger's Daughter, Johannesburg, July's People, Late Bourgeois World, Nadine Gordimer, Nelson Mandela, South Africa. Bookmark the permalink. « Zambia’s President Sata resurfaces. State House releases pictures.